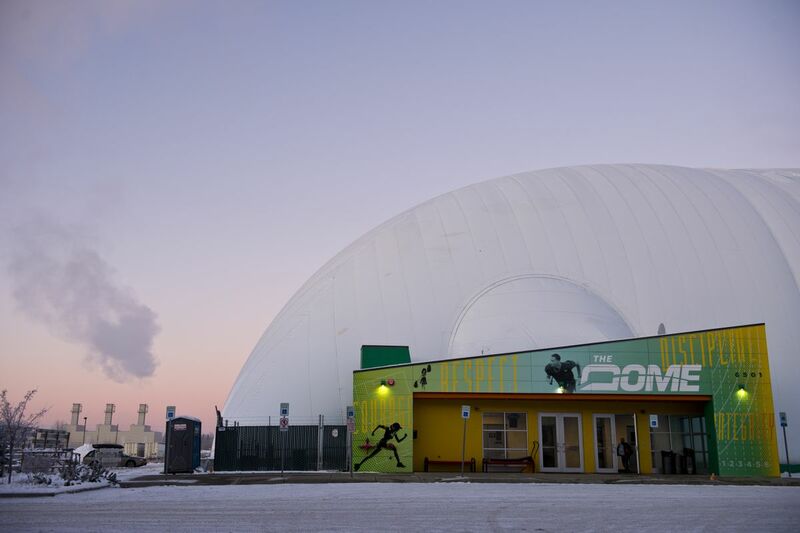 A year after The Dome's inflatable roof collapsed under the weight of snow, the once-bustling indoor sports venue in Anchorage will reopen later this week, CEO Curtis Penney said. On Monday, the facility previously used by thousands of people was back up and running, in a limited opening for contracted user groups, such as youth sports teams, Penney said. The limited opening allows The Dome to train new staff before its official reopening, Penney said Monday during a break between meetings. The public opening date has not been set, but will be held sometime later this week, he said. The multi-use facility with a track circling synthetic turf was destroyed on Jan. 21, after accumulated snow and water pressed down, crushing the roof. Users were evacuated several hours before the collapse, and no one was hurt. The damage to the 200,000-square-foot facility left a large population of youth teams, runners and other athletes scrambling to find indoor exercise space in schools and anywhere else. The collapse cost more than $7 million to repair damage and settle the claims of bondholders, Penney has said. Anchorage developer Jonathan Rubini orchestrated a deal providing financing and addressing bondholders' claims. The turf installation and the discovery of mold after the Dome was reinflated — requiring assistance from an industrial hygienist — delayed a planned November reopening. Members affected by the collapse are eligible for a credit, The Dome's website says. In addition to new turf, "brighter-than-ever LED lighting" also awaits users. "We're excited. Everyone's been working really hard," he said.